I AM MORE THAN A MOTHER: Life with an empty nest: Missing My Sailor! As many of you mom's know, it can be very difficult when the kids start leaving the house. Well, in my opinion, it can be even harder when one of them decides to join the military. I haven't seen my son since his wedding last year. With his schedule and multiple deployments, it will most likely be close to a year and a half between visits. 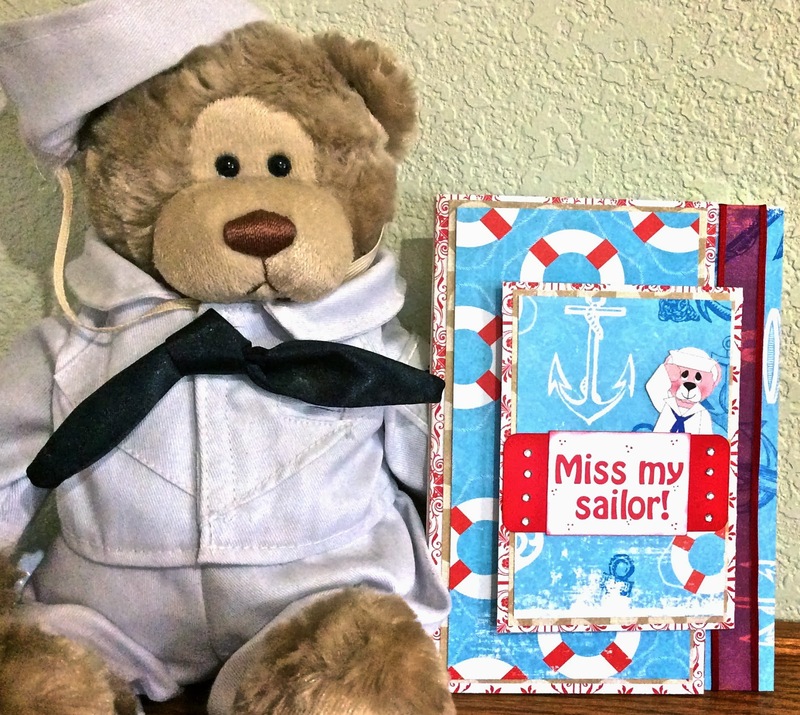 The card I made today was inspired by my son, Dalton, my favorite sailor in the US Navy. This card is a modified joy fold card. I wanted to make a bigger card than most tutorials call for. So, I just changed the dimensions to fit a 7" x 5" envelope. The small outside card was made using the Silhouette. 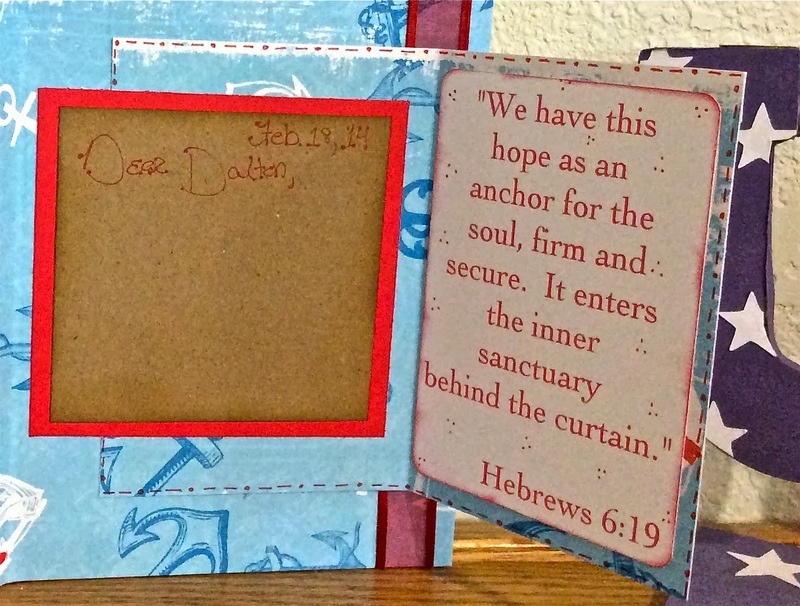 On the inside of the small card, a Bible verse (right) was added using the print and cut feature of the Silhouette. There is also room for the greeting (left). On the inside of the big card (far left) the sentiment "USA" and the anchor were cut using the Stand and Salute Cricut cartridge. I love you Dalton! Praying for you everyday. Safe travels. and give your kids a big HUG today!! A very lovely card with the nautical theme and the folds. Thank you for sharing this lovely art with us. Please come back soon. Cindy this is adorable!! I LOVE the fold!! This is such an awesome card, and I am SO blessed to have you stop by and share with us in our challenge this week. What a blessing to have you join us. Please stop by again soon - we love to have you play along. This is a fabulous card! I love that you added a verse on the inside. Super papers and image choice as well. I pray for the safety of our military men & women every day and I am so thankful for their service!! Great use of this week's colors at Cupcake Inspirations! Just love it! Awesome card! And, a big thank you to your son for protecting our country! Thank you for joining us at Cupcake Inspirations this week. Good Luck. Such a cute card!! From one Navy mom to another tell your son thank you for his service. Thank you for sharing with us at Love to Create Challenge. What a great card! I love your use of the verse in the fold out! Wonderful card! My dad was in the Navy so there is a special place in my heart for our Navy Boys!! Great card! Prayers to your son for safe keeping away and safe travels home! Thanks for joining us at Cupcake Inspirations! Cute card and nice design. Thanks for playing in the SweetStamps challenge this week. This is amazing, beautiful , touching !!! I am so glad you shared this wonderful project with us at Cupcake Inspirations !!! Beautiful card! Thank you for joining our Make it Sparkle with Bling Challenge over at Love to Create this week. Congrats! Just came from Fantabulous Cricut and they posted you as the winner. Wonderful sailor inspired card. My brother was in the Navy. He was in Submarines. He also got to be the Easter Bunny at the White House during Pres Clinton term.